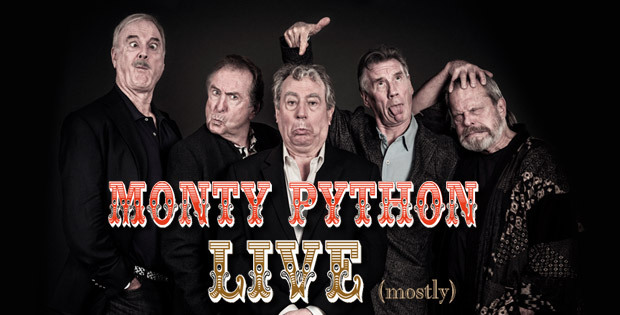 Boomstick Giveaway: Get Your Passes to ‘Monty Python Live’!! We are giving away sixteen passes to the amazing event ‘Monty Python Live (Mostly), courtesy of the good folks over at Fathom Events. If you’re a fan of anything Monty Python, then this is an event you won’t want to miss as the remaining members of the comedy troupe will be performing live on stage, which will be shown in theaters across the U.S. at the same time for your enjoyment. We have passes for Tinseltown Movies 17 in Grapevine, TX on Sunday July 20th at 7:30pm. How do you win? Well it’s simple. A LIVE broadcast from the final performance of Monty Python’s last stage show together (probably). Fathom Events and Picturehouse Entertainment invite you to experience comedy legends Monty Python’s long-awaited reunion when Monty Python Live (mostly) is broadcast LIVE to cinemas nationwide on Sunday, July 20 with rebroadcasts on Wednesday, July 23 and Thursday, July 24. For the first time in over three decades, comedy legends Monty Python will be performing live on stage together at London’s famed O2 Arena. At a combined age of just 361, John Cleese, Terry Gilliam, Eric Idle, Terry Jones and Michael Palin will once again perform some of their greatest hits, with modern, topical, Python-esque twists. Don’t miss your opportunity to be a part of one of the biggest live events of 2014! Step Two: Tell us what your FAVORITE Monty Python skit and or film is and why! Monty Python To Reunite For Live Stage Show At London’s O2 Arena In 2014!!! This entry was posted on Thursday, July 10th, 2014 at 3:04 pm	and is filed under Events, Film, News. You can follow any responses to this entry through the RSS 2.0 feed. You can skip to the end and leave a response. Pinging is currently not allowed. « Frances Fisher Joins Helen Mirren and Ryan Reynolds in ‘The Woman in Gold’!! !